Warmblood breeding practices and registration guidelines. Sporthorse. The Friesian Sporthorse Association is the official registry of the Friesian Sporthorse, and the name Friesian Sporthorse™ is a registered trademark of the Friesian Sporthorse Association. This is the only website for the Friesian Sporthorse Association. Other websites claiming to be registries for Friesian Sporthorses are not the FSA. Registration papers issued by these organizations may not be accepted by the Friesian Sporthorse Association, and may be meaningless in determining if a horse is a true Friesian Sporthorse. All correspondence from the FSA will clearly indicate it came from the FSA, with nearly all email correspondence originating from the official FSA email address: FSAFriesianSport@aol.com. Other variations of this email address are not the FSA. If you are uncertain, or have any doubts, please contact us via email or telephone, we are happy to help. We are also happy to search our database to verify the registration of a horse. What makes the Friesian Sporthorse Association different from the various registries for Friesian crossbreds? The Friesian Sporthorse Association is the official registry of the Friesian Sporthorse, and is the only registry dedicated to recognizing and promoting the true Friesian Sporthorse exclusively. The FSA is the only registry to be internationally recognized as a breed registry. We are not just another registry for recording Friesian crossbreds, we are a breed registry devoted exclusively to the Friesian Sporthorse, thru recognition, promotion, and strict breeding guidelines aimed at preserving and improving the Friesian Sporthorse as a developing breed. The FSA is the preferred registry choice for sport-bred Friesian crosses. Why are warmbloods and Thoroughbreds favored for crossbreeding with Friesians? Decades of Warmblood and sporthorse breeding have proven these breeds to be the most successful for creating horses which will have the maximum potential for success in sport. While all breeds may have lovely characteristics and characteristics which make them special for certain disciplines, our focus is on Friesian Sporthorses exclusively. The development of our criteria has been strongly influenced by established sporthorse and Warmblood breeding practices, as well as the breeding practices which have been proven most successful among true Friesian Sporthorse breeders. Why are some non-traditional breeds acceptable for Auxiliary Book registration, and others are not? Some non-traditional breeds have been proven to cross nicely specifically with Friesians, while still keeping the Friesian Sporthorse objective in mind. Because these breeds are not as accepted or proven for sporthorse breeding as Warmbloods or Thoroughbreds, they are not eligible for Main Book registration, however they do deserve a place in the development of the Friesian Sporthorse, and therefore are eligible for full registration in the Auxiliary Book. Why do you accept purebred Friesians, when this is a registry for Friesian Sporthorses? Purebred Friesians play a vital role in the development of Friesian Sporthorses and it is important to recognize and record them as well, if they are actively contributing to the development of the Friesian Sporthorse thru crossbreeding. What if I am not entirely sure of my horse’s breeding, or I don’t have proper documentation? You may still apply for a Certificate of Pedigree. Information should be indicated as “unknown” or “believed to be”, as applicable. A minimum 25% Friesian heritage must be verified for Friesian Sporthorse registration. How do I get my horse DNA tested? It is a very simple process to submit for DNA testing directly, as the owner, and then simply send a copy of the results to us. (see our Links page for a link to UC Davis for DNA submission.) We can also handle this service for you. What is the difference between the terms "Friesian Sporthorse" and "Friesian Sport Horse"? There is a big difference between the terms "Friesian Sporthorse" and "Friesian Sport Horse". "Friesian Sporthorse" refers to the breed, as defined in our Breed Standards and our Registation Guidelines, and as registered with the Friesian Sporthorse Association. The Friesian Sporthorse Association is the official registry of the Friesian Sporthorse. Friesian Sporthorse™ is a registered trademark of the Friesian Sporthorse Association. "Friesian Sport Horse" is often used as a generic term to describe any Friesian crossbred, regardless of the breeding or registry affiliation. How can I get more involved with the Friesian Sporthorse Association? Contact us! We welcome ideas, suggestions, etc. Can I become a member if I don't own a Friesian Sporthorse? Yes! It's easy. Simply use the Membership Application instead of the Application for Registration. What if my horse is already registered with another registry? This is not a problem, we welcome members and horses which are also affiliated with other registries or who wish to transfer their horse's registration from another registry. Why are some non-traditional breeds acceptable for Main Book registration, and others are not? A few non-traditional breeds have proven to cross especially nicely specifically with Friesians, while still keeping the Friesian Sporthorse objective in mind. Because of the success of these specific crosses, the decision was made to include them in the Main Book. What is the best abbreviation for Friesian Sporthorse? People most commonly abbreviate 'Friesian Sporthorse' by using the initials of the registry (FSA) which also denotes the horse as a registered Friesian Sporthorse affiliated with the FSA. What is the difference between a PINTO FRIESIAN SPORTHORSE and a FRIESIAN/PAINT CROSS? "Pinto" is a color, and can be found in many breeds, including Warmbloods, Saddlebreds, and Georgian Grandes. 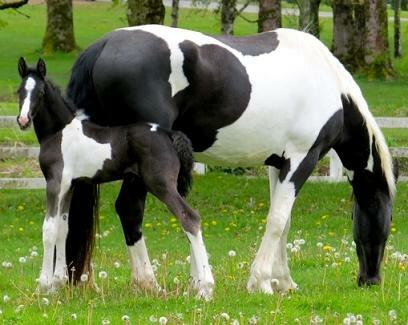 "Paint" is a stockhorse breed, essentially a pinto colored Quarter Horse. A "pinto Friesian Sporthorse" is a horse which has met the requirements for Friesian Sporthorse registration and is pinto colored, usually derived by combining Friesian blood with pinto Warmblood and/or pinto Saddlebred and/or pinto Georgian Grande blood. Pinto Friesian Sporthorses may be registered in the Main Book, Auxiliary Book, or Friesian Warmblood Book, depending on the pedigree. Friesian/Paint crosses may be issued COP papers, but because Paint is not recognized as a sport breed Friesian/Paint crosses may not be registered in the Main Book, Auxiliary Book, or Friesian Warmblood Book. Send your original registration certificate to us along with payment and paperwork verifying your horse has met the criteria for Elite Book status, a Mare Predicate, or Breeding Approval. (Paperwork may include copies of dressage tests, show results printed off official websites, copies of inspection or in-hand score sheets, etc.) Please visit "Registration Forms & Fees" to verify the cost. Your horse's new status will be upgraded in the database and a new Registration Certificate will be issued. Contact us at FSAFriesianSport@aol.com with any questions. registered in the FSA's Main Book.